My neck tattoo got me hired. Not fired, hired! At the risk of encouraging people who don't know themselves or art getting highly visible tattoos, I'd like to present the story of how my neck tattoo didn't get me fired, it got me hired. Now, clearly bad neck tattoos are devastating mistakes that have lifetime repercussions, but for me it is tough to read all the news headlines about people who have made bad neck tattoo decisions without responding with my story of how tattoos can be empowering to a professional career. Tattooers have the right to deny anyone their services, especially commonly regretted tattoos. That said, a client deserves to get what they want, even if it is bad. Some lessons can't be learned without actual experience. It is always unfortunate when these mistakes and ensuing squabbles swamp the headlines and get passed around the Internet-o-sphere. Tattoos have a tremendous effect on the wearer, either negative or positive, and I for one am tired of hearing all the negative when the reason tattoos are exploding is because of the positive effects. Many of my own personal experiences are very different than the mistakes I read about in my daily google "tattoo" news feed. Please do not take this as a recommendation to get neck tattoos, but I would like to offer my experience as an alternative to the tattoo artists and fans who keep reading about high profile tattoo mistakes. In my very early twenties I had a pretty sweet life as a traveling programmer. I had landed in Paris to program a multimedia adaptation of a popular children's book. Tin Tin's shop was the first place I looked up, of course, and I headed through the strange city streets to find his studio... wicked young, nearly baby faced, unkempt and most likely barefoot (it was a good thing I could program!). The few tattoos I had were not visible, but even then I knew that I wanted to save my arms, back, and front for large pieces. So the skin I had for a 2 to 5 hour collector tattoo was already relatively limited. When he asked what I wanted, to my surprise I replied with "a bird on my neck". I was shocked to hear this as I had not really thought about getting such a visible tattoo. Somehow, then and there, it seemed like the *only* tattoo he could put on me. As a skinny young american kid with no visible tattoos I didn't stand a chance of him doing the tattoo. Those were tattoos tattooers saved for themselves, or for maybe for heavily tattooed friends of the tattooer. He looked me over and instead of saying "no" right away he told me that his closest appointment was in two months. It seemed like he might have been slightly surprised when immediately I asked to secure the appointment, and away I went. After working solid for two months straight, and the work was crazy - from 7 in the morning to 3 in the morning with maybe a day or two off, you can imagine how excited I was when I set off to get the tattoo. After a fantastic experience, and an ok story I'll trade over a tasty beverage sometime, my young hippie neck had a nice colorful "blue throated mirror". I couldn't hide it. My co-workers at the video game company all laughed in surprise when they realized that I was having an artist named Tin Tin tattooing my neck, all this time they thought I was excited to get Tin Tin the illustrated character on my neck. Needless to say, they were all floored by Tin tin’s impeccable tattoo of a bird. Well enough of the backstory, the whole point of this is to talk about the effects of this highly visible neck tattoo. While I grew up very antisocial and had next to no social grace as soon as I had a beautiful non-threatening tattoo smack dab on my neck, more and more people started talking to me. Quickly I realized that if I were to grumble and be rude to every person interested in my tattoo, I wouldn't stop grumbling all day! It also felt that as a tattooed person, I had some sort of obligation to put my best foot forward, to do my part to teach the public that tattooed people we're not all the bad stereotypes they thought we were. So after years of being a weird antisocial loner with a few very patient friends, I learned to talk to people in a positive manner. It wasn't as hard as I thought, evidently talking about colorful bird tattoos puts people in a good mood, and eventually tattooing taught me to be a nicer person. While this was happening I was feeling another strong effect. While it is obvious that a badly done misspelled vulgar tattoo on your neck can hurt your job prospects, no one prepared me for the strange phenomenon I was about to experience. For the next few years, as I was interviewing with many different companies, I kept landing the great gigs. Instead of the job circuit drying up, I was landing more jobs working on projects for Honda, Polo Ralph Lauren, and even installations at the Epcot Center where Disney is notorious for not hiring tattooed people. Plenty of other very qualified programmers were interviewing for the same jobs, some older, some more experienced, some cheaper... I dont know what they talked about, but in nearly every interview I was asked about my neck tattoo. Stories of Paris followed, and they stared at my neck, sometimes uncomfortably, while I talked about my experience programming there, the follow up projects for the Smurfs and Lucky Luke. Nearly every time, instead of talking geek, they would reply they had never seen such amazing color in a tattoo or one of the wide variety of compliments Tin Tin’s artwork gets. People weren’t scared or running away, they were mesmerised. Jobs weren’t disappearing, opportunities were growing. Now, it may seem like a stretch to link my success as a freelancer programmer directly to the colorful bird tattoo (and soon after tattoos) on my neck, but I can absolutely say that if it has turned anyone off of hiring me, thats A-OK with me. And I'm pretty sure that more than once as the hiring boards were reviewing their interviews and picking someone, they didn't hire the "funny talented programmer with the experience"... they hired the "funny talented programmer with the experience and the amazing tattoo on his neck." There is little doubt in my mind that the highly visible quality artwork helped, not hindered, my programming career. I can't thank Tin Tin enough the brilliant tattoo, for not making my life decisions for me, and for allowing tattooing to teach me how powerful of a positive force it can truly be. I am sure many people reading have also had positive experiences with their tattoos, please share them with us via email or comments. 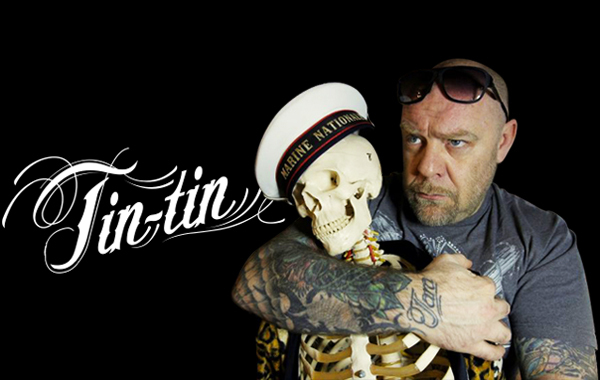 NOTE: TIn Tin is a unique, world famous, high caliber tattooer, and has been for over 20 years. He also hosts one of the world premiere tattoo conventions, the Mondialdu Tatouage. Highly visible skin deserves to have highly qualified experts tattooing it. If you don't respect tattooing, or your skin, the mistakes you can make will have long lasting negative effects.